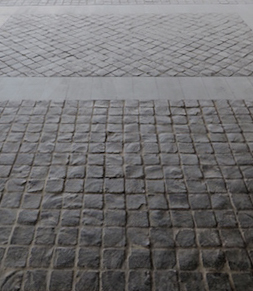 Historically cobblestones are rounded cobble-sized stone were used for roads, laneways, driveways and buildings. These days they are more likely to be square or rectangular and rather small in size which is an advantage as it gives them enormous strength. 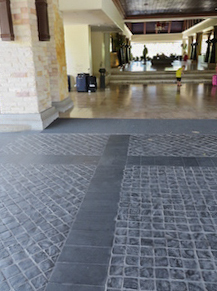 The breaking load strength of outdoor stone pavers is usually inversely proportional to their size. So you see - big is not always best! 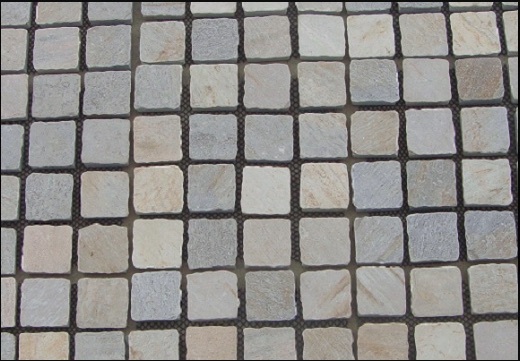 Quartzite and basalt (or bluestone) are ideal stone types for outdoor paving use because of the density and strength. They also have low water absorption rates too - all factors conducive to long working lives i.e. durability. 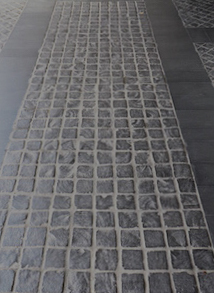 Hard wearing cobbles that are also consistent with a rustic look are being used very creatively by specialist fit-out designers such as in PJ Gallagher's Boulevard Hotel, Enfield that has a distinct Irish theme. The bluestone cobbles (image right) were teamed with naturally split black slate along the floor around the bar as well as magnificent timber throughout. If you look closely, you can see hardwood timber and black slate used in a checkerboard fashion at the rear of the bar area - wonderful design! Practical too as whatever is chosen for a pub environment has be hard wearing and easy to maintain. Oak barrels have been used as tables with wooden stools to further develop the theme of natural products used floor to ceiling. The design was created by Peter Jay, Peter Jay Design Associates. Bluestone's toughness gives it excellent wear and tear resistance; bluestone is used for structural work because of its high compressive strength and durability. 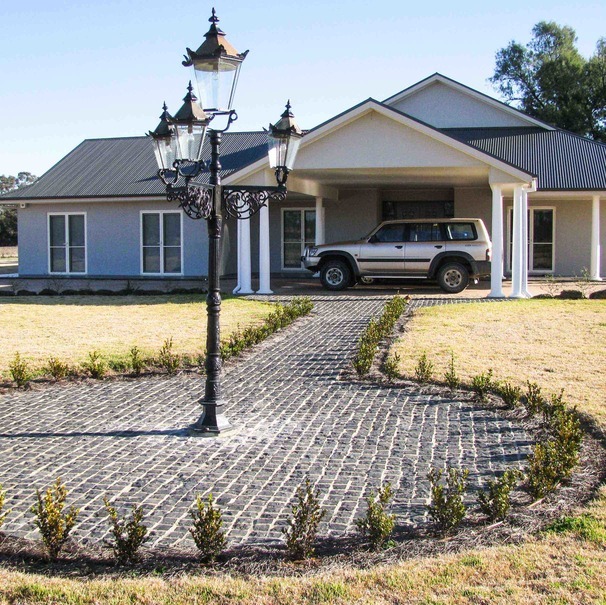 The dark colour of bluestone makes it ideal for heavy traffic areas as it doesn't show the dirt or rubber from car tyres. The natural split surface offers a textured surface with very high slip resistance that provides a rustic, casual look that is familiar to anyone that has traveled across Europe. If laid professionally, cobbles should last a lifetime - they are really tough. In Europe they have lasted hundreds of years. 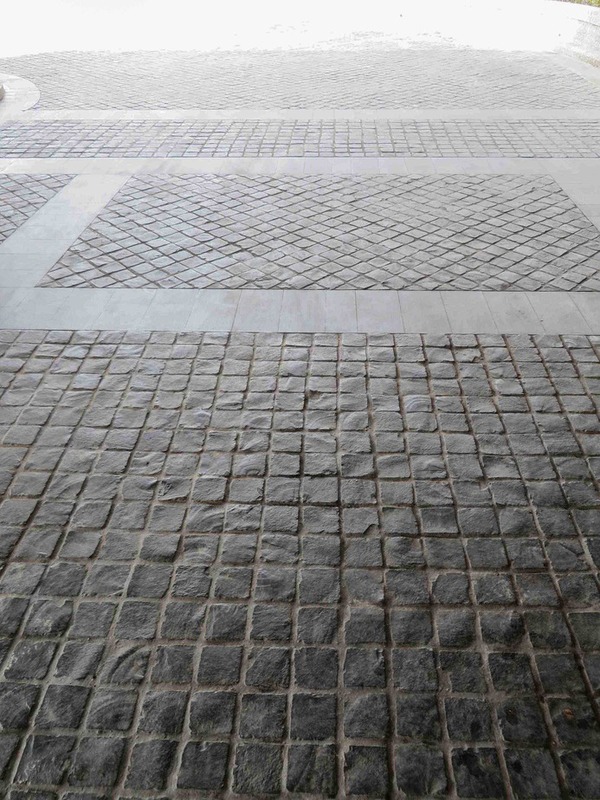 Bluestone is a very versatile stone and readily takes a number of finishes to suit the needs of the project. The natural split surface provides a safe, grippy surface especially on driveways that are built on an incline. 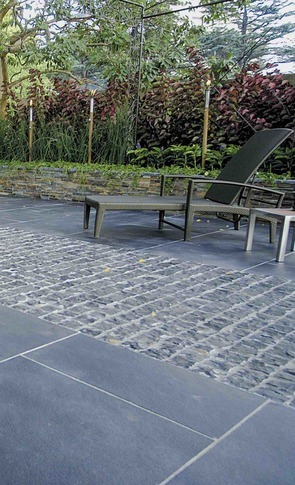 The cobbles are also favoured by landscapers for use on paths and walkways. Cobbles were very effectively used as a design feature to break up a wide expanse of concrete on a pedestrian lane way in Mudgee, NSW.